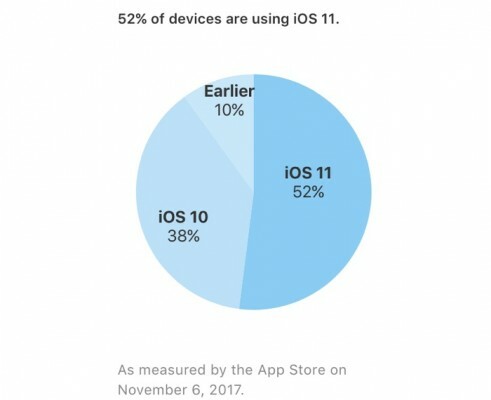 iOS 11 is adopted slower than iOS 10 previous year, but the number of iOS installations has grown after the latest update has been released. Basically, as for November 6, the overall statistics looks as follows: 52 percent of devices run iOS 11, 38 percent run iOS 10 and 10 percent run earlier iOS versions. Several updates for iOS 11 have been released already, including a lot of new emoji, 3D Touch multitasking, Reachability feature and other. iOS 11.2 is going to bring Apple Pay Cash, the new peer-to-peer Apple payments.